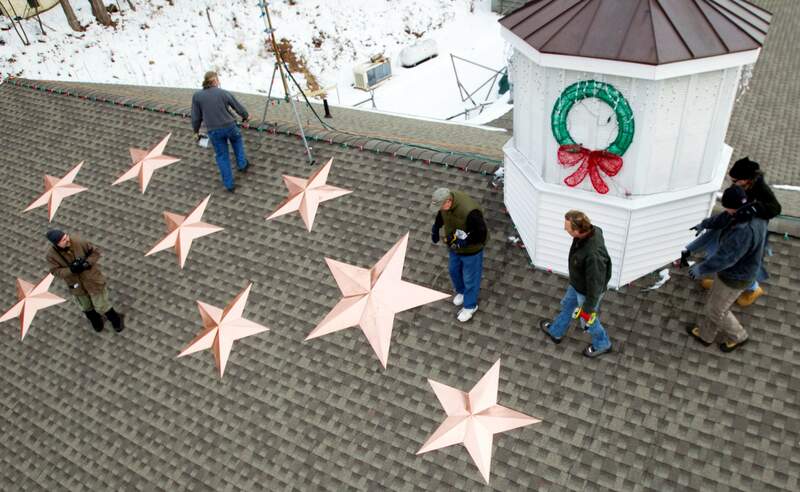 People work on the installation of 26 stars on the roof of the Sandy Hook fire station Tuesday in Newtown, Conn. The stars were made and installed to honor victims of the school shooting. NEWTOWN, Conn.  Since escaping a gunmans rampage at their elementary school, the 8-year-old Connors triplets have suffered nightmares, jumped at noises and clung to their parents a little more than usual. Now parents such as David Connors are bracing to send their children back to school, nearly three weeks after the shooting rampage at Sandy Hook Elementary School in Newtown. It wont be easy  for the parents or the children, who heard the gunshots that killed 20 of their classmates and six educators. Classes will start Thursday at a repurposed school in the neighboring town of Monroe, where the students desks have been taken along with backpacks and other belongings that were left behind in the chaos after the shooting Dec. 14. Families have been coming in to see the new school, and an open house is scheduled for Wednesday. Teachers are returning as well, and some already have been working on their classrooms. At some point, all those will be honored, but officials are still working out how and when to do so, Robinson said. After the evacuation, teachers grouped their children at a nearby fire station, Robinson said. One sang songs, while others read to the students, she said. Julian Ford, a clinical psychologist at the University of Connecticut who helped counsel families in the days immediately after the shooting, recommended addressing it as questions come up but otherwise focusing on regular school work. It will be important for parents and teachers to listen and be observant, Ford said. Each of the boys and girls are going to have different reactions to different aspects of the environment, different little things that will be reminders to them, he said. Parents might have a harder time with fear than children, Ford said. Before the shooting, a baby sitter would take Connors children to the bus stop. But Connors said hell probably take the third-graders to the bus the first few days. His children, who escaped unharmed, ask questions about the gunman. Connors said his children are excited to go back to school but predicted they might be nervous as the first day approaches. He hopes the grief counseling services continue, he said.